Chris joined MCRCD in September 2014. 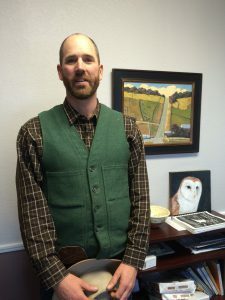 Chris has twenty years of experience in agriculture working on ranches in Nevada and California, ten of which have been here in Mendocino County. Chris has managed livestock on private and public ground and has extensive experience working at the interface of private livestock grazing and public agency regulations and requirements. In Willits, Chris has been involved in the conservation and management of Baker’s meadow foam, an endangered species. He has also been involved in researching the relationship between grazing animals and grassland ecosystems. Chris lives and ranches with his family in Willits.